Maxi Health Research® has developed CircuMax™, a unique product combining high potency, standardized Butchers Broom, Horse Chestnut, and natural Vitamin E.
Butchers Broom’s active component ruscogenins and horse chestnut is an astringent. Vitamin E is an antioxidant that acts to protect your cells against the effects of free radical damage. 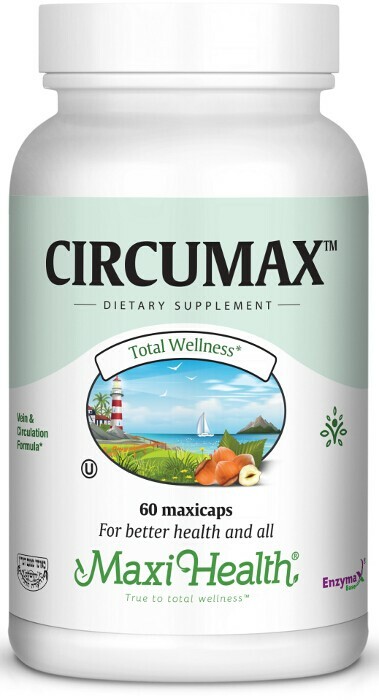 For circulation support, try CircuMax™, a natural, standardized formula. Microcrystalline cellulose, vegetable cellulose, magnesium stearate, Enzymax® powder (calcium carbonate, bromelain, papain, lipase, amylase, protease, silica). This product contains NO animal products, wheat, gluten, soy,sugar, salt, yeast, milk, artiﬁcial ﬂavors, colorings or preservatives. Enzymax®, a vital digestive enzyme complex, is a registered trademark of Maxi Health Research LLC®. I have terrible varicose veins and I was in constant pain. Finally my neighbor told me to try Vitamin E I tried a few different kinds until I found Maxi Health’s Circumax. I have been symptom free ever since and it is now a few years. Thank you so much for a great product. I couldn’t live without it!